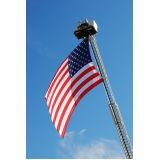 Show your patriotic pride by flying our exceptional American flags from Tuff Flags. All our American flags are proudly made in the USA with passion. Our U.S. Flag means so much to Americans. It stands for our freedom and sovereignty, it symbolizes the bond between all of us from so many cultures and different wallks of life, and it stands for our history of patriots, men and women, some who have given their lives in war and those who have dedicated their lives to the betterment of our nation for future generations. America's flag stands for all of this, which is why all of our American Flags are made in the U.S.A. with care and diligence. 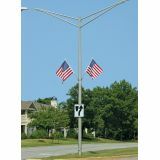 We offer a 6 month guarantee on construction for our complete line of American Flags. 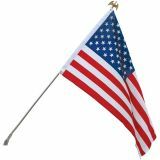 Choose from heavy duty polyester outdoor flags, durable, light nylon outdoor flags, elegant indoor fringed US flags, traditional cotton flags and the many economical printed US flags we have available. 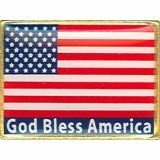 Honor our brave servicemen with our cemetary stick flags, grave markers, and lapel pins in various designs for every event and observance. 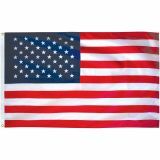 Shop from our wide collection of American Flags right away. You'll find the best prices on the web, quick shipping, and much more! 100% customer satisfaction guaranteed! American Flags are the proud insignia of American history and success. 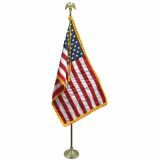 Put your patriotic pride on proud display with our finely crafted American Flags that are 100% made in America by Americans. 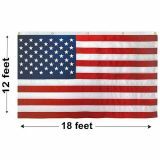 From the massive pole mounted flags to the mini hand held flags and everything in between, we have American Flags in all possible sizes and models for every special occasion and celebration. 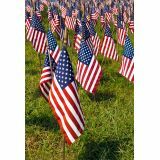 Not just flags to show your national pride but also flags to honor our fallen heroes like grave markers and cemetery flags, we have everything you need! 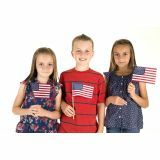 Designed to ensure long lasting beauty and durability, our high quality US-made American Flags also make excellent gifts and priceless keepsakes. The richness and beauty of the star and strip designs, the colorfast UV resistant ink imprints, and the reinforced design all make the American Flags from Tuff Flags a feast to the eyes of the beholder! Our industry knowledge is second to none and we know your flag needs better than anyone. 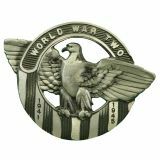 We also have lapel pins for every occasion and indoor flag sets complete with ornaments, hardware, gold tassels, and cord. 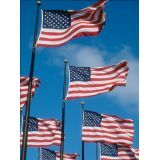 We have searched the entire United States to bring you the best value in US-made American Flags. Be it the pretty indoor flags, the weather resistant outdoor flags, the grave markers or fund raising flags; just tell us your needs and we have it all and more. Selecting the right flag from our impressive collection can be hard. Call for any help you may need in selecting the best flag for your needs (888) 287-3524 or email us at customercare@tuffflags.com.